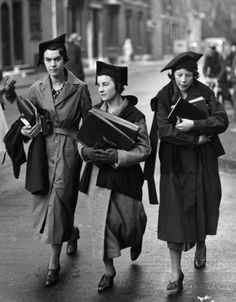 Subfusc is a Latin term used to refer to a specific type of academic dress worn by students at Oxford University. It is a black gown of varying lengths and shapes worn over formal attire by students during examinations, some lectures, dinners and numerous other occasions. If Oxford were like many other universities, subfusc, would be a period costume and nothing more: something one might expect to see depicted in movies like Brideshead Revisited or the Shadowlands, but not an item of contemporary apparel. Thankfully, Oxford is not like any other university. Last week as I was having breakfast in a hotel in Oxford’s city centre, I could see outside the window phalanx of students, impeccably dressed and donning their subfusc, heading into an austere stone building to take their examinations. This was not some historical reenactment of life at Oxford in the 1920s; this is life at Oxford now and if the students have anything to say about it, it will still be life in Oxford for many years to come. Last week the Oxford Student Union held a referendum. The question it posed: Should students still be required to wear subfusc on the usual occasions? One of the university’s vice presidents proposed that this was an archaic tradition that the students would be glad to get rid of. The result: more than 75% of the student body voted in favor of keeping the unusually shaped black gowns as required apparel for Oxford students. The students who actually live their lives in and out of these garments expressed a strong desire to maintain this centuries old tradition. This does not mean, however, that Oxford students are simply intransigent and unwilling to adapt to the modern world. In 2012 rules regarding the type of subfusc that each gender was permitted to wear were lifted, but the general rule that students must be dressed in some type of the uniform were maintained, proving that it is possible to adapt a tradition to modern needs without throwing it off entirely. Oxford University takes modern youth, from a variety of backgrounds and races, and invites them into a different life. It is a life steeped in centuries of tradition, where students know that they are a part of something much larger and more significant than just the concerns of the present age. But because its life is comprised primarily of the young, Oxford is always confronted with new ideas and new thoughts. So what you end up with is a city and a University that is at once extremely old, while at the same time being eternally young. It has both the reverence of ancient tradition and the vitality of new life, and that is, in my opinion, exactly what the church should look like. The ability to adapt tradition without dispensing with it, has proven to be Oxford’s strength and the Church’s weakness, and this is crucial because it is that very ability that will lie at the heart of any successful prayer book revision. The next prayer book revision needs to take a close look at three critical questions regarding the 1979 Book of Common Prayer: What we have; what we lost; and what we need. While I admit that I am not the biggest fan of the 1979 prayer book, there is much there that works and works well. Some of the prayers are clumsy and dated, but some work very well. Overall, the 1979 prayer book, when it is actually followed, can produce beautiful and wonderful liturgies in worship styles that range from high Anglo-Catholic to low protestant and everything in between. It is imperfect, but for many of us in the church now it is the tradition that has formed us, and that is not to be taken lightly or easily dispensed with. All revisions and reformations have a tendency to go too far. Things get pushed aside or left behind in one generation that the next generation finds itself in need of. Any revision of the 1979 Book of Common Prayer needs to look backwards as well as forwards. We need to look back at previous revisions and identify places where something of value was lost. How can a new prayer book connect modern Christians to ancient rituals and beliefs? How can we help today’s worshiper feel that oneness of spirit with Christians in every other generation? If we can accept that merely casting off old traditions is not an acceptable solution to moving forward, can we look back and identify some traditions that previous revisions dispensed with in too much haste? Much has changed in the last 30+ years. Technology is vastly different. The battlegrounds within the church and within the world have all changed. A new prayer book must take into account the world it is being sent into. It must be able to invite individuals from every background, race, gender and sexuality into the life of the church. This will mean adding and altering some services and it is here principally that the ability to alter traditions without dispensing with them altogether will become key. There are many reasons why I would propose that now is not the time to be contemplating prayer book revision in the Episcopal Church, but my primary reason that I pray we hold off, is that we simply have not done the work of finding out from our youth and young clergy what the answers are to those three questions: what we have; what we lost; and what we need. Like the students at Oxford wearing subfusc, it is the young in the church that are going to have to actually live with and in any new revised prayer book, so any discussion of revision must begin with them.